The Constitution won’t allow the government to turn natural-born subjects into ‘aliens’ without a referendum. Giving a minister such unbridled power would be ultra vires, says Dr Terry Dwyer. The question of Commonwealth citizenship was discussed in the Federation debates before 1901. As Quick and Garran explain, it was decided to deny the new Commonwealth power over citizenship because we were then British subjects in a wider Empire and because no one wished a future Commonwealth parliament to be able to deny participation in the Commonwealth to any person who was entitled to the civic rights of a resident of a Colony which became a State. Hence the Commonwealth Constitution only refers to subjects of the Queen, residents of a State or the people of a State. Note that the Australian Citizenship Act took effect only in 1949. Millions of living Australians were born as British subjects and many are still proud of it. The only oath of allegiance this writer has ever taken in his life was to the Queen of the United Kingdom upon entering Commonwealth service in 1972. The Commonwealth was only granted, and only has, a concurrent power to legislate with respect to “naturalisation and aliens”, that is a power to make laws to give aliens (non-subjects) the status of a natural-born subject of the Queen and a power to make laws regarding non-subjects (eg, internment laws for enemy aliens in wartime). 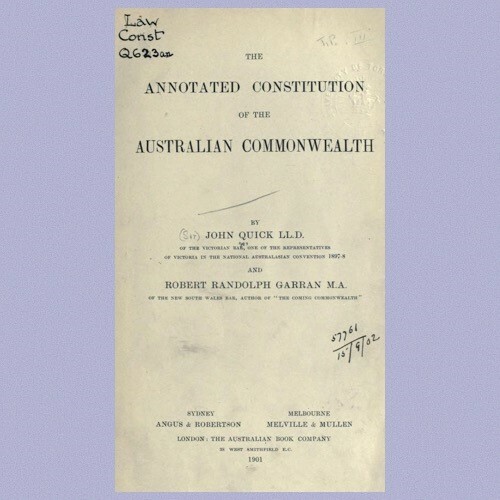 The Constitution thus does NOT give the Commonwealth a power to turn “natural-born” subjects of the Queen into “aliens” (to be re-defined without a referendum as “non-citizens”) and the decision to the contrary in Pochi’s case – http://www.austlii.edu.au/au/cases/cth/HCA/1982/60.html – needs to be re-examined. The Commonwealth cannot unilaterally expand its powers by re-defining the meaning of words in the Constitution (something the High Court should be astute to prevent). Note carefully that the terms “naturalisation and aliens” depend upon the assumed pre-existing legal concept of a “natural born subject of the Queen”. At the time of Federation, this meant a natural born subject of Queen Victoria and her heirs and successors in the Crown of the United Kingdom: the oath of allegiance at the end of the Constitution is drafted on that basis. Who was a natural-born subject of the Queen rested upon common law as modified by the Imperial Parliament up to 1901. Following the change in the Royal Style and titles to “Queen of Australia” and the passing of the Australia Act in 1986, it seems that the concept of a “subject of the Queen” now means a “subject of the Queen of Australia”. In other words, Australia is to the UK now what Ireland and Scotland were before the Acts of Union. We are different realms sharing a common sovereign. That means that all the pre-1901 law on “natural-born subject of the Queen” should be read as applying to the Queen of Australia. Once that change is understood, the Australian Citizenship Act can make sense as an Act to naturalise non-subjects of the Queen of Australia and assimilate them to natural-born subjects. But it goes beyond its Constitutional head of power if it tries to strip natural-born subjects of the Queen of their nationality. A referendum is required before we see the monstrosity of a Minister being given power to declare native-born Australians aliens in their own land. The High Court may have some serious thinking to do about going back to legal basics and legal history. Let us hope a love and reverence for ancient learning may once again be the bulwark of the defence of the liberties of the subject against over-mighty usurping Ministers. * Dr Terry Dwyer is principal of Dwyer Lawyers, Canberra ACT, and a member of CLA. Bring on a High Court challenge!